January Sales – It’s not quite over! Buying a bargain at this time of year can be quite stressful – you know what you need to buy but perhaps can’t find it, you’re being enticed by low prices on items you don’t need and doubting whether perhaps you do. It can all be overwhelming when you want to make sure you are getting Value For Money. At the beginning of the sales I had two things on my list, a midi skirt for work and a designer pair of jeans for out-out, i.e. not for dog walks! I failed on my first couple of shopping trips, and decided not to bother with the jeans as you need to dedicate time to finding the right pair, and the sales environment doesn’t really offer that! And then the saying goes “when you are not looking, you’ll then find it” and I did! It’s reminded me that the January sales, is for January and not just the first couple of days after Christmas; what I mean by this is towards the end of the month, retailers give more discount off and so what may not have seem like a good price at the beginning, it certainly is now. Some of the extra discounts, like I got on my jeans, you have to be in store, I’m not surprised as retailers want people to visit and they need to clear the shop’s stock to make room for new season – so venture out and you never know what delightful little bargains you’ll get. 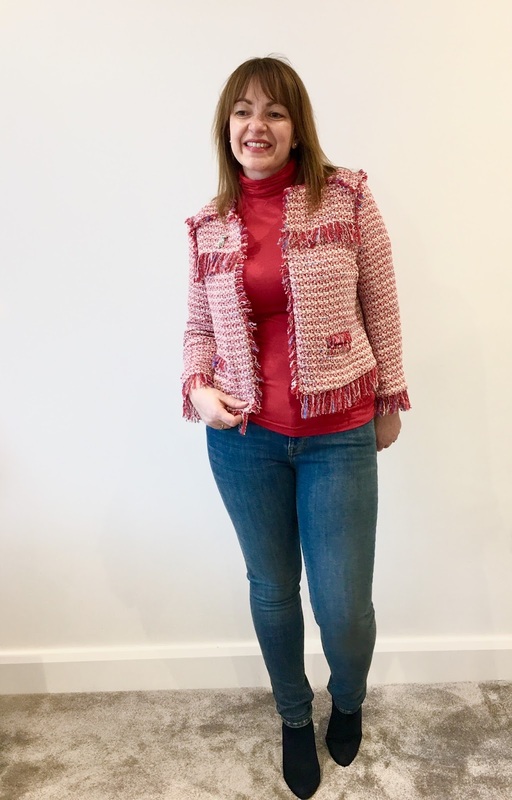 Let’s start with my jeans, I got them from AllSaints, they should have been £88.00 but I paid in store £28.16 – they had been reduced twice, plus I got an extra 20% in store – what a bargain! I’m wearing them here with my fabulous navy shoe boots from Next (gifted to me by a dear friend Katie – thank you!) and Kettlewell’s red silky roll neck, this comes in lots of colours and I find the fabric is ideal for dressing up an outfit. And the jacket, well that was another bargain too from Zara – it should have been £69.99, but I paid £19.99 – this is going to be perfect for my weekend break to Portugal that I have in March as the evenings are likely to still be chilly. I’m sorry I cannot find it on their website so you will need to head in – there were quite a few left in store. 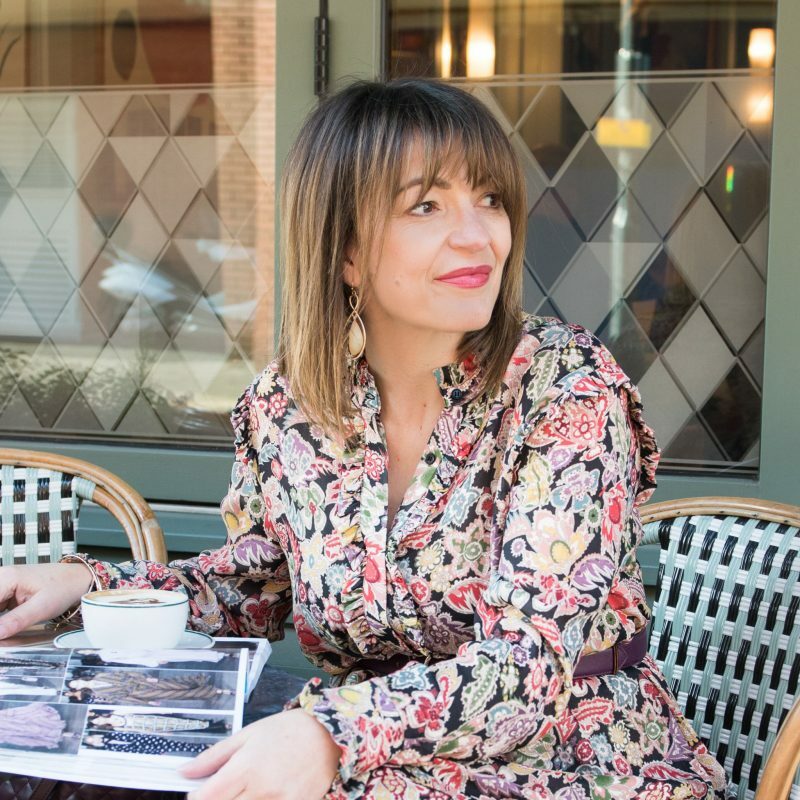 I found my midi skirt at Jigsaw in a recent shopping trip in Marlow with my mum – I was unsure about what colour or pattern I wanted but was keen to have good quality, by not having anything specific in mind left me open to lots of opportunities. I settled on this heavy satin midi skirt which fits lovely around the waist, it’s true to size and hangs really well. Creases slightly, so you do need to make sure you smooth it out before you sit. It also comes with pockets, which I love in a skirt of this style. I found it online! This colour, shadow grey and foliage green are £60 down from £120, but if you love pink, you are going to be super happy, as this is now £36 for their magenta. Whilst I’m wearing it with jumper and long boots, the fabric is light enough that I know I will wear it over spring/summer with a cami and flip-flops. So you will get a lot of wear out this skirt – I’m actually tempted to get the pink myself! And so you see it is still worth visiting the shops for those last minute bargains, don’t be fooled the racks are messy so you will have to hunt, but at least now the changing rooms are a lot more quieter than when the sales first started, it’s definitely worth taking the time to try before you buy – and don’t forget it’s only a true bargain if you really need it – here’s my link again to my top tips for getting the best out of the sales. Good luck! Let me know what you buy by leaving comments on any of my social channels – Twitter, Facebook or Instagram. The post January Sales – It’s not quite over! was on Loved by Lizzi first. Previous Post Spring 2018 – Easy trends you can adopt!